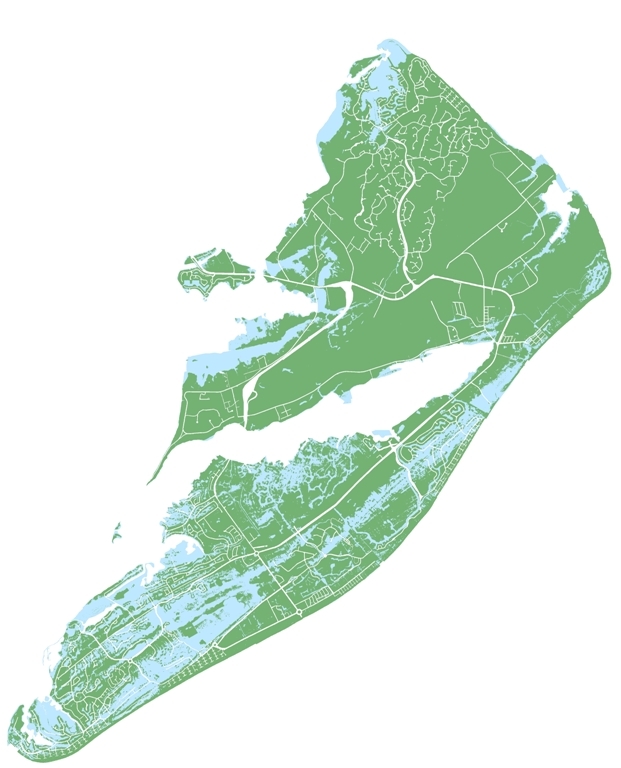 Hilton Head Island, South Carolina is highly vulnerable to land loss from sea level rise and accelerated rates of shoreline erosion due to its low average elevation, low slopes, high tidal fluctuations, and exposure to seasonal storms. The island is a centerpiece of the South Carolina beach-based tourism industry which stands to suffer significant losses to infrastructure and ecosystems unless long-term adaptive planning is implemented. Yet, adequate planning requires high-quality, science-based projections of those areas likely to be impacted by a future rise in sea level. Most projections for future sea level indicate that we will experience a rise of at least 2.25 ft by the end of the century. 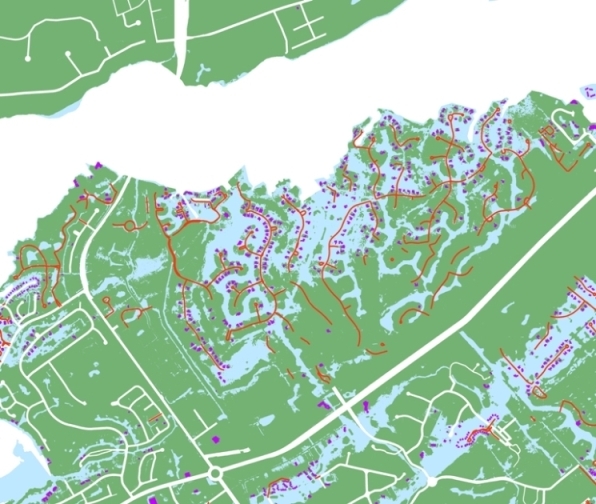 We overlaid low lying areas with parcel data provided by the Beaufort County GIS Office and 30 m LandSat data to categorize loss areas by land cover and zoning. We also overlaid the lost land with the current road network and building footprints to identify problem areas. Because mean high water at Hilton Head is 3.75 ft in elevation, the 6 ft contour interval was used to estimate a sea level rise scenario of around 2.25 ft. The map (below) shows areas of land that will be impacted by a 2.25 foot rise in sea level. The areas in blue represent areas that will be inundated with water more than 50% of the time and the green areas will be flooded less than 50% of the time. The map below shows buildings that touch elevations below 6 ft and are shown in orange along with road segments that will be impacted by a 2.25 ft rise in sea level shown in red.